Even after the founding of the first St. Louis school board in 1833 and first elementary schools five years later, St. Louis pupils attended monitorial-style schools. 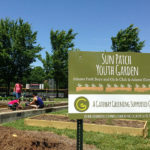 Funding came from the city earmarking five percent of the income it derived from its common lands, providing the lion’s share of school dollars. Just after the Civil War, three of every four dollars the public schools received came from property taxes. St. Louis opened its first high school in 1855, among the first coeducational high schools in the United States. When completed at 15th and Olive, one pundit hailed it as the “most lavish schoolhouse west of New York.” And with good reason: the school cost some $50,000 to build. Within five years, 301 young scholars attended. Gilded Age Americans came to realize that education was more than just the proverbial Three R’s. School is also a place where youngsters learn discipline, life skills, and values as well as the mechanics of reading, writing, and arithmetic. Working under such thinking, William Torrey Harris built St. Louis Public Schools into a national model during the 1870s, combining systematic teaching methods, strong discipline, and basic proficiencies. Susan Blow proposed to Harris that St. Louis Public Schools try the new “kindergarten” concept, an experiment in teaching young children needed skills before they start going to school all day. He authorized Blow to create the city’s first kindergarten in 1875; at the century’s end, nearly 200,000 St. Louis children attended them. So effective was the system Harris built that St. Louis won five grand prizes at the 1900 Paris Exposition for work created by local elementary and high school students. Traditional views about school design suggested that almost any room could be transformed into a classroom. Early schools were rented spaces, after all. As recently as the late 1860s, the system leased rooms for African-American schools. By the turn of the century educational thinking held that the construction, design, and floor plan reflected the priorities of the school and its effectiveness as a place for learning. St. Louis architect William B. Ittner was a national leader in designing school buildings. He combined ideas from other fields to create a new type of educational facility. He used ideas from urban planning to design interiors with better traffic flow and movement. He designed schools around the functions they needed to serve and the jobs that had to be done, letting the design emanate from them. Today’s public school buildings designed by William Ittner, such as Soldan or Mullanphy, remain some of the finest early twentieth-century architecture in St. Louis. As St. Louis grew with an influx of foreigners at the turn of the century, so too did its student population. These new arrivals placed further demands on the system because of language barriers. As late as 1881, 20,000 St. Louis teachers still used German in daily lessons; English became the only language used in public schools by legal mandate in 1887. The other demand on the system that led to physical plant growth was compulsory education, signed into law in Missouri in 1905 by Governor (and former St. Louis attorney) Joseph Folk. Requiring that children go to school came from an impetus beyond the intrinsic value of an educated population. Progressive reformers during this period sought to end child labor in factories. Child labor laws prohibiting hiring workers below a certain age created a new problem, though: what to do with all those youngsters all day while parents worked. Requiring them to go to school addressed that need. At the same time, though, it also put an added burden on public school systems. St. Louis public education is both heir and victim to its history. It holds the legacy of innovation and excellence in teaching, and possesses some of William Ittner’s finest architectural work. The shoulders of William Torrey Harris and Susan Blow are there to stand upon. At the same time, it is also a victim of past politics. Its tax base has receded since the city is hemmed in by the 1876 Home Rule Charter, with highest property values-and taxes-outside the city system. Yet the demands on the system are greater than ever. Court-mandated desegregation is but the tip of the educational iceberg. Schooling requires quality teachers, new technology, and modern tools-all of which take money. Yet the ghost of 1876 remains. 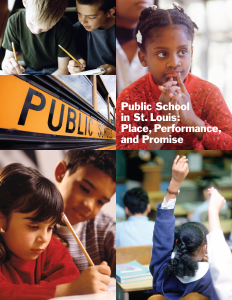 Click Here for the entire article on the St. Louis Public Schools from the City of St. Louis website.